What is the E7 Motion Board? Motion boards are energy-boosting floor tools that can provide you with health benefits while you work. The E7 gives users the abilities to burn more calories, increase circulation, and even reduce fatigue at sit-stand desks. It features a slightly different shape than traditional balance boards you see today. This board comes with a little extra surface area for standing, so you can safely vary your postures while still getting some of the same health-benefitting balancing action that you would want from balance board. How is this board "ergonomic"? Sitting and standing are just the tips of the ergonomic iceberg. 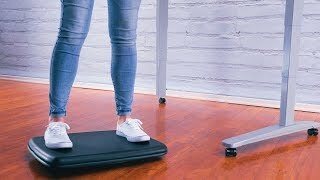 More movement is what you really want, and the E7 lets you increase movement at your sit-stand desk so you can be on your way to better health with one easy addition! Although the E7 Motion Board is fun to use, it's not a toy. We recommend storing it in a place where children cannot access it for safety. Although you do balance on the E7, it was designed to give your body more stable movement than a typical balance board, and has a slightly reduced range of motion from our E3 Motion Board and Bamboo Motion-X Board. Should I do anything to protect my E7 Motion Board or floor when I use this? If your floor is hardwood, it's a good idea to have a tightly woven rug or standing mat to use underneath the mat to protect it and your floors from scratches or scuffing. We even have a standing mat just for the occasion! I wear high heels, can I wear them on the E7? Due to the range of motion of the E7 Motion Board, we do not recommend that users wear high heeled shoes while using the board, as they can affect your ability to maintain balance while standing and may pierce the top of the board. This product comes standard with a limited lifetime warranty. For more information on UPLIFT warranty coverage, click here.